Crude oil is a commodity that is a basic requirement, a staple all around the world. OPEC, the international oil cartel, announced that they would cut production to stabilize the price of petroleum at their December 2016 meeting for the first time in years. The price of crude oil was trading at over $100 per barrel in June 2014. But by February 2016, the price of the energy commodity fell to the lowest level since 2003 when it hit $26.05. There are many changes that occurred in 2016 in the crude oil market that will impact its price. Changes in any market create opportunities for investors and traders and crude oil is no exception. ...to coordinate and unify the petroleum policies of its Member Countries and ensure the stabilization of oil markets in order to secure an efficient, economic and regular supply of petroleum to consumers, a steady income to producers and a fair return on capital for those investing in the petroleum industry. In the face of falling oil prices, OPEC blamed shale oil production from North America as the reason for the lower price. The cartel, led by the largest producer Saudi Arabia, decided to pursue a strategy of flooding the market with oil so that the price would drop below production cost in the U.S., causing the output to grind to a halt. OPEC’s goal was to build market share by removing a competing producer from the market. While the number of rigs in operation in the U.S. fell precipitously, the flow of oil did not decline at a commensurate rate. Meanwhile, the members of the cartel continued to sell oil aggressively. The lower price caused many members of OPEC to sell more oil to maximize revenue flows and the number of barrels of oil sold into the market on a daily basis continued to rise. While the price recovered from the February 2016 lows, oil remained at less than half the price it was in June 2014. OPEC came to the realization that the strategy to build market share and increase the price of oil by forcing shale production from the market was not effective. The Russians are also a major oil-producing nation. Starting in early 2016, the Russians began talks with OPEC members. One of the problems within the cartel was a contentious relationship between two powerful members, Saudi Arabia and Iran. Russia, with an interest to increase the price of oil, worked as a mediator between the two nations to address the situation. A meeting in Doha, Qatar in March set the stage for cooperation between OPEC members and the Russians. The second meeting in Algeria in late summer set the stage for a change in the cartel’s strategic path. In Algeria, members of OPEC together with the Russians agreed on the framework of an accord that would abandon the policy of flooding the market with crude oil. 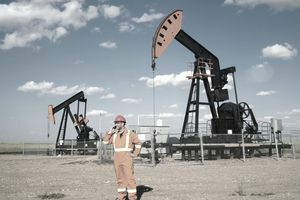 A production quota that included caps and freezes by some members and cuts by others would be discussed and approved at the November 30 biannual meeting of OPEC in Vienna, Austria. In the lead up to the official OPEC meeting, negotiations continued. Market expectations for a deal remained low, the tension between the Saudis and other member nations that insisted on exemptions from any output quote made many dubious that a deal would result. However, at the eleventh hour, the members reached a compromise. The deal meant that the strategy of selling oil without abandon came to an end. A few weeks before, on November 8, the winds of political change swept across the world as the U.S. elected Donald Trump the 45th President of the United States. During the contentious campaign for the highest office in the world’s largest economy, the candidates debated many issues. One of the topics that took center stage was the position of the U.S. in the world and the incredible energy potential of the nation. Over the past eight years, the Obama administration was highly sensitive to issues of climate change and other environmental concerns that caused an increase in regulations on the energy industry. The incoming administration has promised that for each new regulation, they will get rid of two existing regulations and the energy industry is likely to be front and center when it comes to those changes. Over recent years compliance with government rules has increased the cost of doing business in the energy patch. As those rules become less onerous on business in the months and years to come it is likely to reduce the production cost of energy commodities and crude oil is no exception. Additionally, one of the other campaign promises was to make the U.S. energy independent. The United States has enormous reserves of crude oil and natural gas within its borders. A lower production cost for energy commodities because of less regulation will increase output. Additionally, technological advances have lowered production costs over recent years. When it comes to oil production, horizontal versus vertical drilling rigs has resulted in more efficient output. As output costs decline and production increases, the United States could increase exports of crude oil as well as satisfy the nation’s requirements over the coming years. Another one of the campaign promises from the new administration was to rebuild the United States to create jobs by rebuilding roads, bridges, airports and other parts of the nation’s aging infrastructure. The last time there was a major infrastructure building project in the United States was in the 1950s during the Eisenhower administration. The building will require raw materials and demand for many metals, minerals, and energy commodities will rise. Over recent years, since the 2008 financial crisis, the U.S. Federal Reserve has employed monetary policy to stimulate the economy by encouraging borrowing and spending and inhibiting saving. However, the central bank has often said that monetary policy can only go so far and fiscal stimulus is necessary to spur economic growth. An infrastructure building project will provide stimulus and it is likely that economic growth will increase in 2017 and beyond. As GDP rises, the demand for crude oil is likely to increase pushing prices higher. A stable and higher crude oil price will keep the energy commodity above its production cost and the energy production business will thrive in that environment. The bear market in crude oil lasted from June 2014 through February 2016. As of the end of 2016, the price of the nearby crude oil futures contracts contract on the New York Mercantile Exchange division of the Chicago Mercantile Exchange was trading above the $50 per barrel level. Brent crude oil that trades on the Intercontinental Exchange was at a premium to the NYMEX crude. While the price remains at half the level it was in 2014, it is still at a level where U.S. output can flow and with fewer regulations and rising demand the energy business in the United States could be on the verge of a new renaissance. The XLE is the Energy Select Sector SPDR EFT product that reflects the performance of companies in the oil, gas and consumable fuels, energy equipment and services industry. Increasing energy output with fewer regulations is likely to improve performance in energy-related companies. However, the value of the ETF is a function of the price of the commodities. The risk-reward for this ETF differs when oil is at $30 per barrel level compared to the $50 or $100 per barrel levels. But when energy companies are profitable, the ETF tends to appreciate.